Having a dog means having a schedule. You arrange work hours, social outings, and errands based on when you can get home. If you’re anything like me, you sometimes skip a night out because you feel guilty leaving your dog home alone. Dogs enjoy the company of their humans, but that doesn’t mean leaving them home alone is bad or dangerous. Read on to learn how long you can leave a dog alone, and tips to make their time at home safe and enriching. The first question most people ask about leaving their dog home alone is: how long can my dog last without a bathroom break? According to experts, dogs generally need to pee between three to five times a day. But the timing of potty breaks varies from dog to dog, and puppies and seniors need more frequent breaks. Of course, the above estimates vary depending on a dog’s size, health, and habits. But any dog forced to hold their urine for too long is at risk for urinary tract infection, stones, or crystals. Plus, holding urine for too long is just plain uncomfortable, and can lead to accidents in the house. For safety and comfort’s sake, provide a potty break every four to six hours. Standard work days are eight to ten hours long, so if you can’t swing home at lunch to take the dog out, hire a dog walker for worry-free care. Individual exercise needs vary depending on your dog’s age, breed, and health level. Herding and sporting dogs often require more intense and lengthy activity; lower-energy breeds and older dogs can do with significantly less (source). But every dog needs to stretch its legs a couple times a day. In general, healthy dogs need about 60 minutes of moderate activity every day, but it doesn’t have to be continuous. Before you leave your dog home alone for a length of time, spend 20-30 minutes taking them for a brisk walk or play session. Tire them out so their alone time will be more relaxing. Then, a midday romp (with you or a dog walker) will help break up the day, and of course, spend quality time together when you’re home for the night! If your dog acts anxious or destructive after spending time alone, it’s possible they need more frequent and intense exercise. Speak to your vet to determine an ideal fitness routine for your pet. In general, healthy dogs need about 60 minutes of moderate activity every day. Beyond how long a dog can hold it, or how much exercise a dog needs each day, mental activity is important to keep your best friend healthy, happy, and well-behaved. Puppies and young dogs need more enrichment than adults, but all dogs need a certain amount of mental simulation throughout the day (source). Without it, they may become bored, and even destructive when left alone. Whether it’s a training session, exciting neighborhood walk, puzzle feeder, or a round of indoor games, enrichment activities help keep your dog healthy, and balance out the time she spends alone. Stuffable toys are a classic: fill them with treats or peanut butter. Freeze for a challenge! Treat-dispensing are popular with our office dogs. Safe chews are a must-have, like the naturally-sourced antler chews. All dogs are different, and some can handle more alone time than others. But every dog needs periodic potty breaks, exercise, and mental simulation. If your work schedule means your dog spends most of the day home alone, consider booking a trustworthy sitter to stop by and give your dog a break. A dog walker or sitter can give your dog the activity she needs during the day, and help you feel better about being gone—and make your homecoming all the more sweet! Authored by Rover Staff: With 200,000+ providers, Rover is the largest network of 5-star pet sitters and dog walkers in North America. 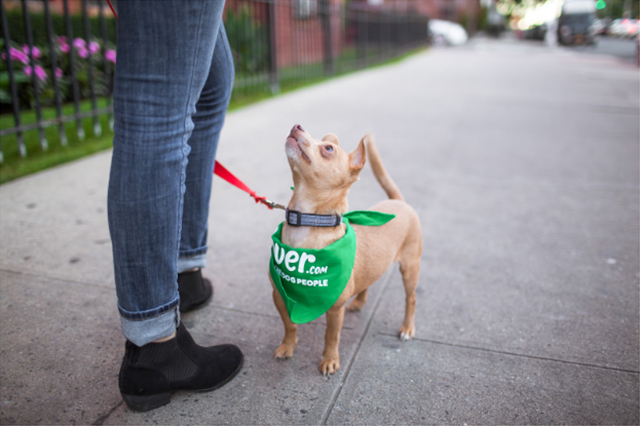 Whether you need in-home dog boarding, pet sitting, dog walking, or day care, Rover connects pet parents with dog people who’ll treat their pets like family. Claim $30 off your first service here! Legal Terms: Applies only to new Rover.com customers (one per household) using a valid, unexpired coupon to book a service for the first time through Rover.com. The $30 coupon value will appear in your Rover account once redeemed and will be applied toward qualifying service(s) purchased (not including applicable taxes, if any) in a single booking. Any coupon value in excess of amount of first booking will be forfeited. May not be combined with other offers. No processing fee. Void where prohibited. Bookings and services are subject to the Rover.com Terms of Service. Promotion code may not be re-posted to other websites without Rover.com approval. Expires 12/31/2019.